An Indigenous woman with roots in Saskatchewan participated in a rally expressing support for Nathan Phillips, an Indigenous elder and veteran who was surrounded and harassed by teenagers wearing "Make America Great Again" hats in a video posted to social media on Saturday. 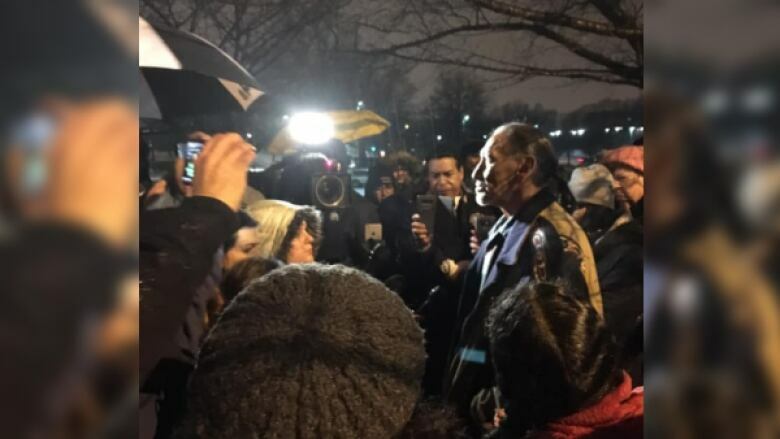 An Indigenous woman from Saskatchewan participated in a rally in support of Nathan Phillips, the Indigenous elder and veteran who was harassed by a group of teenagers sporting 'Make America Great Again' hats. Former Afternoon Edition host Michelle Brass was in Washington D.C. to participate in Indigenous Climate Action meetings. After the annual Women's March event—which Brass participated in—she was checking out social media, and said she was surprised to see very little chatter about the gathering. Instead, she saw videos and posts featuring Phillips. "As Indigenous peoples, we have always been looking for respect and restitution and repatriation for so many of the experiences that have happened in our own homelands," Brass told CBC News. She was part of about 60 people who gathered in support of Phillips on Saturday outside of the Basilica of the National Shrine of the Immaculate Conception in D.C.
Brass said in today's day and age people are expressing themselves very boldly and everyone that recognizes hatred, bigotry and oppression are wrong need to stand up and speak out against it. The videos of Phillips being harrassed made her feel a wide range of emotions. "I was very angry, upset, saddened, to see that kind of treatment, to any person, but particularly an elder and somebody who has stood up for Indigenous people and the country that he lives in," Brass said. Brass asked people to take note of the response to the now-viral video. "The action that happened at the church was peaceful, the songs that were sung were prayer songs, they're songs that convey a fierce love and determination for our people—and all people," Brass said. "This act of hatred was not retaliated in a similar way. It was responded to with love and dignity." She said Phillips set the example of being a kind and loving individual that translated to the group of supporters that gathered outside of the Basilica of the National Shrine of the Immaculate Conception. Brass said ultimately it isn't up to her, Phillips or his supporters to decide the fate of the youths who harassed the elder. "We're looking for justice, not revenge or vengeance or anything like that," she said. "I would ask, what do people of that young man's community… of the non-Indigenous or people of colour, what do they think should be done?"